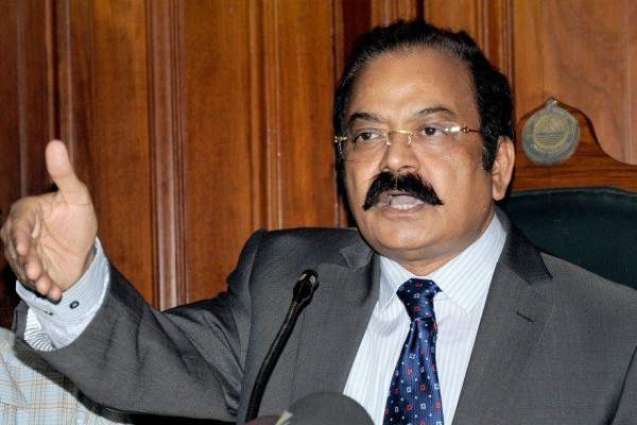 LAHORE: Punjab Law Minister Rana Sanaullah has on Wednesday said that Pakistan Tehreek-e-Insaf (PTI) Chairman Imran Khan was “responsible for the prevailing shoe-throwing culture”. Speaking to media persons, he said that “senseless criticism” of the opponents in their speeches was enraging workers and subsequently leading to shoe-hurling incidents. He warned that if the practice was not stopped, no one would be spared in the near future. He particularly named Sheikh Rashid as the one “who would top the list of shoe-receivers”. He further said that Khan was responsible for intolerance in the society and said that both the PTI chief and Asif Ali Zardari were the “new faces of establishment”. Commenting on the Pakistan Muslim League-Nawaz (PML-N) worker Mirza Ramzan Baig’s arrest after he tried to hurl a shoe at Imran Khan, the minister said that his confessional statement was nothing but a result of all the pressure. He warned that if things continue like this, everyone including media persons could become a victim. On Sunday, PML-N founder Nawaz Sharif was attacked with a shoe at Lahore’s Jamia Naeemia. Later that day, an attempt to attack Imran Khan with a shoe was also made and the accused was arrested. However, in another incident, the PTI chief was targeted once again, but the shoe hit PTI leader Aleem Khan instead.